Vitag Analytics is the tool for retailers who want to obtain more insight into the performance of their stores. Through an easy-to-use web-based service and iOS apps, comprehensive store analysis and store monitoring can be achieved in a simple and convenient way. Either login or receive automated emails of hourly and daily customer traffic. Combine this with sales data to analyse sales conversion ratios and improve staffing levels. Check the status of all your stores security systems from a central location. Customer counting is available as a standalone product or as an integrated option in our range of Nexus Optima AM30 and Maxus AM50 security detection systems. Nexus and Maxus – more than just a security tags system. Vitag (CrossPoint) Analytics gives you complete insight into the performance of your stores. Right from a comprehensive overview of your national network of stores right down to the smallest detail on the status of a surveillance system. Get insight in visitor flows, trend analysis, evaluation of advertising campaigns, deployment and performance of your personnel. Increase your buyer-to-traffic ratio and revenue per customer thanks to real-time management information, 100% customised to your needs. Centralization of Point Of Sale and visitor counter information enables proper store performance analysis. 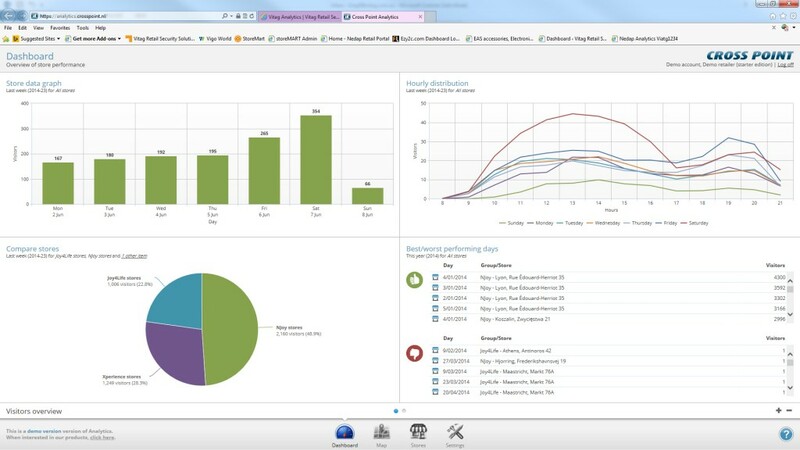 Cross Point Analytics collects the centralized information and presents this in a clear and easy to use interface. Personalize your dashboard by configuring various graphs, for quick and easy insight in visitor footfall for single stores or groups of stores. Reports, containing single or multiple graphs spread across a single page or multiple pages, can be sent to various recipients or to the head office for further analysis. Stores can be grouped in standard, personal and smart groups, making store comparison easy and complete.